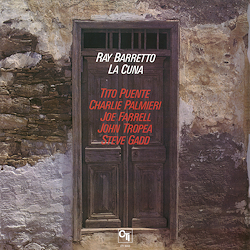 ﻿Ray Barretto disliked his music being labelled 'Latin Jazz' - yet the album "La Cuna" is one of the most memorable of this genre, since it amalgamates the diverse moods of both Americas. In this album, the expertise of the legendary producer Creed Taylor is combined with an all-star ensemble and the supreme musicality of the skilful jazz percussionist Barretto to create a tightly-knit performance. The title-giving opening number sails along merrily with a salsa swing, but then the soaring flute melodies and the powerful piano improvisations cool down the Caribbean rhythms. How the players mingle driving patterns with delicate melodies to form beautiful song is demonstrated best in "Doloroso" and also in "Mambotango", whereby the latter exudes controlled coolness in the somewhat electric mood. John Tropea leans seemingly intentionally towards Santana and his art of guitar-playing, and this is further enhanced by the late Joe Farrell's phenomenal performance. A further tribute is paid to one of the greatest musicians ever to combine various styles and trends with a speeded-up version of Stevie Wonder's "Pastime Paradise". To conclude: if not Latin Jazz, then definitely Latin AND Jazz.